It is, of course, the oft repeated cry of Buzz Lightyear, the space ranger action figure from the Toy Story film franchise. The thing about Buzz Lightyear is that he does not realise that he is a toy. He believes that he is the real Buzz Lightyear, a real space ranger. Throughout the film Toy Story he embarks upon various missions and challenges, uttering his rallying cry, ‘To infinity and beyond’, convinced that all of his equipment is fully functional. He doesn’t realise that his communicator is just a sticker, or that his jet pack is completely non-functional. The truth only dawns when he sees a TV advertisement for a Buzz Lightyear Action Figure. Realising he is just a toy and not the Real Buzz Lightyear after all he falls into depression and has a nervous breakdown. His cry of ‘To infinity and beyond,’ seems a bit pointless once the truth dawns upon him. Jesus picks up on several sayings from the Law. And it’s important here to understand that Jesus is dealing with legal requirements placed upon people, and saying that his must be prepared to forego that which the Law dictated or said they were entitled to. We usually see this as meaning that people had a right to revenge – far from it. This was not saying that if someone wrongs you then you may get your own back. It comes from Exodus (Exodus 21:24) and was not a mandate for personal vengeance but a principle to guide judges in determining appropriate judgements – the punishment for a crime against the person is limited and may not exceed the injury done. Yet Jesus says that even this proportionate retaliation is too much. Do not resist an evildoer. But if anyone strikes you on the right check, turn the other also. Again, this is a legal reference. The word ‘resist’ in the Greek literally means ‘stand against.’ Jesus seems to be saying ‘Do not stand up in court against someone who has done something wrong against you. If someone hits you on the right cheek don’t go to court to get the right to hit him back – offer him your other cheek.’ Jesus isn’t talking about someone who is walking down the road and then, out of the blue, gets mugged. The strike on the right check was a deliberate insult. Now – I don’t normally ask people to do this, but imagine you’re facing someone and they’ve done something that has upset you so you want to his them. Assuming you’re right-handed, you would strike them on the left cheek – and for that the Law determined that they could go to court and be given the right to strike you back – once. Now think about how you would strike someone – with your right hand – on the right cheek. You have to do it with the back of your hand. And striking someone on the right cheek with the back of the hand was a calculated insult, done in public, and designed to be deeply humiliating to the person on the receiving end. And because it was seen to be so deeply humiliating the Law said that if someone did this to you his punishment was that you had the right to strike him twice, not once. But Jesus says rather than go to court, rather than seeking to have retaliation for the deliberate insult, offer your other cheek as well. If anyone forces you to go one mile, go also the second mile. The people were living in an occupied country. And a Roman soldier was allowed to compel anyone to carry his pack for a mile down the road. It was Roman regulations that limited it to a mile – oppress people too much and it could lead to unrest, so after a mile you were required to take your pack back and find another person. Understandably people didn’t much like being required to carry a soldier’s pack even a mile – it was hard work. But Jesus says ‘Go the extra mile.’ When you’ve carried the pack the first mile insist on carrying it a second mile. Do more than is asked of you. And, interestingly, if you did more than was asked in this case the soldier could find himself being disciplined for breaking the rules and allowing someone to carry his pack further than the allowed mile. Actually, nowhere in the Law does it say ‘you shall hate your enemy.’ But the requirement to ‘love your neighbour’ had come to have a rather restricted meaning. Neighbour had come to mean in people’s minds the same as fellow countryman. So you only had to love fellow Jews. And it seemed clear to people that if you were to love your neighbour, then that must mean that you must hate your enemy – otherwise the command would have been ‘love everyone.’ But this is not how it should be, says Jesus. You must love your enemies as well, and pray for those who persecute you. A revolutionary idea, especially in an occupied country. Don’t seek revenge through the courts, don’t accept the justice that is your right – but turn the other cheek, go the extra mile, love not just your neighbour but your enemy as well. Jesus’ words must have shocked some of his hearers. As far as they were concerned the Law was clear about people’s right to justice against those who did them wrong, it was clear about who to love and who not to love. But Jesus is wanting his disciples to have a deeper understanding on the nature of God’s ways. It is God’s nature to love indiscriminately – he sends rain on both righteous and unrighteous, and makes the sun rise on the evil as well as the good. And this way of loving must be shown by his disciples too. What reward do you expect to get if you only love those who love you, says Jesus. Even tax collectors do that – apologies to any tax collectors present! Anyone can just greet their brothers and sisters. What you must be is perfect, just like your heavenly Father. You may by now be wondering why I began with Buzz Lightyear. 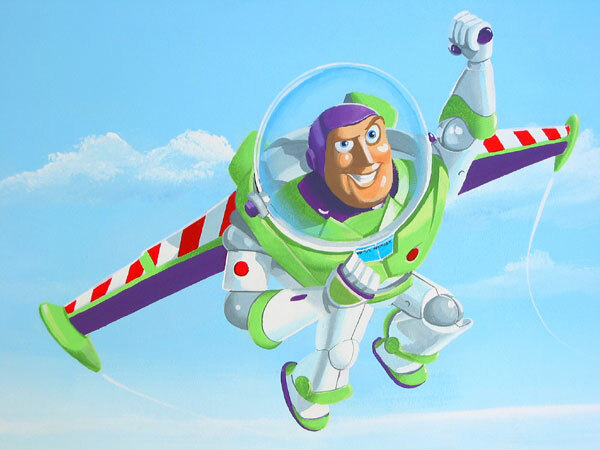 Buzz Lightyear expected to be able to go beyond infinity – an impossibility. As everyone knows there is nothing bigger than infinity. Unless, of course, you’re a mathematician in which case you know that infinity squared is a bigger infinity than infinity. But let’s not go there! And yet, this is what is being asked of those of us who follow Jesus. To do what seems to be impossible. Be perfect as your heavenly Father is perfect. Don’t conform to the norms of society – you are to be different. Buzz Lightyear discovered that he wasn’t real – and when the truth hit him he gave up. If I’m not real, he thought, what’s the point? As followers of Jesus we are as real as we ever can be in this world, because Jesus dwells within us through his Holy Spirit. And being real followers of Jesus, allowing him to make us perfect, means that unlike Buzz, we can go to infinity and beyond. Our gospel reading today, and those of the past two weeks, need to be seen as a whole. Two weeks ago we thought about what it means to be salt and light in our world. Last week we thought about the importance of not just loving but of showing love through our actions. And this call of Jesus to a life of perfection embraces all of that, as well as today’s teaching. We are called by Jesus to aim for the seemingly impossible – to be perfect just like our Father in heaven. To love and to care and to live out our Christianity far beyond what we, or others, might expect to have to, and to do it with gusto! To infinity and beyond! In these gospel readings Jesus has been giving us some deeply challenging teaching. And all of this teaching raises questions about how we must live as Christians in our own society. What does it mean to live without retaliation and yet to seek justice for our world. What does it mean to say that we will not live by the norms of everyday society but that we will turn the other cheek, go the extra mile, love our enemies? What does it mean to go beyond what our society thinks is acceptable in the way we treat immigrants, or prisoners, or the homeless, or families struggling on a single income? To challenge society’s attitudes towards those it looks down upon or despises. What does it mean in terms of what we do in our own church community, when we stop thinking about what we want to do and start thinking about how we can go that extra mile? Our society will know that we are disciples of Jesus because they will see us living out his teachings, they will see us expanding the boundaries of our love and care for others far beyond that which anyone might reasonably expect. The challenge Jesus gives us today is to see how we can live out these his seemingly impossible teachings, and to be salt to our world.